The tower is designed as a High Performance Building, based on the use of sustainable materials, interior air quality, water conservation, and energy efficiency. 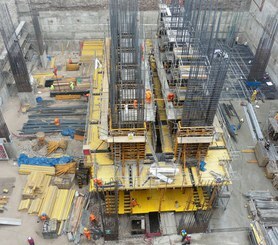 The main core of the building measures 8.1 m by 16.8 m, with ten elevator shafts. 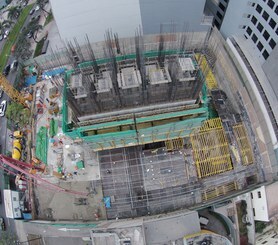 As the geometry is uniform up to the 19th floor, the ATR Self-Climbing System with man-portable NEVI Formwork was chosen to execute the exterior walls of the core. The interior spaces were built with KSP Platforms with gravity pawl brackets set in GP box-outs. This solution proved invaluable to our client in terms of both efficiency and safety. Without being subject to either cranes or the weather, work could continue uninterrupted, thus greatly increasing productivity. Moreover, with three distinct working platforms – main, pouring, and cone recovery – the self-climbing system guaranteed worker safety at any height throughout the entire project. Starting on the 13th floor, the unusual building geometry necessitated the use of considerable cantilevers. The versatility yet compatibility of ULMA Systems allowed us to create an ad hoc solution combining the BRIO and MK Systems to meet even the most demanding requirements. 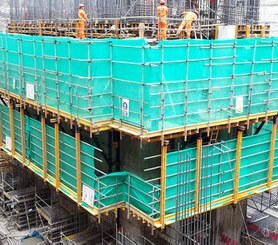 Two separate BMK Brackets were employed to receive loads while placing the scaffolding used for façade finishing work. This solution provided absolute safety and more than met our client’s expectations. 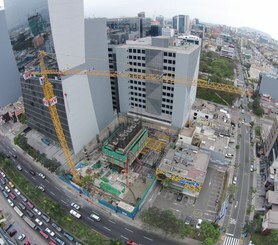 The height of the building required the use of platforms that served as docking bays to facilitate the work of the cranes moving material throughout the worksite.